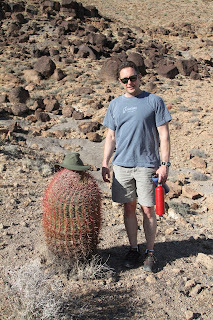 Mark and his new friend. He was a barrel of laughs. 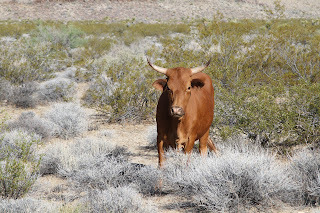 So reconsidering the area, we noticed a place on the map just down the road from Mitchell Caverns called Hole-in-the-Wall. 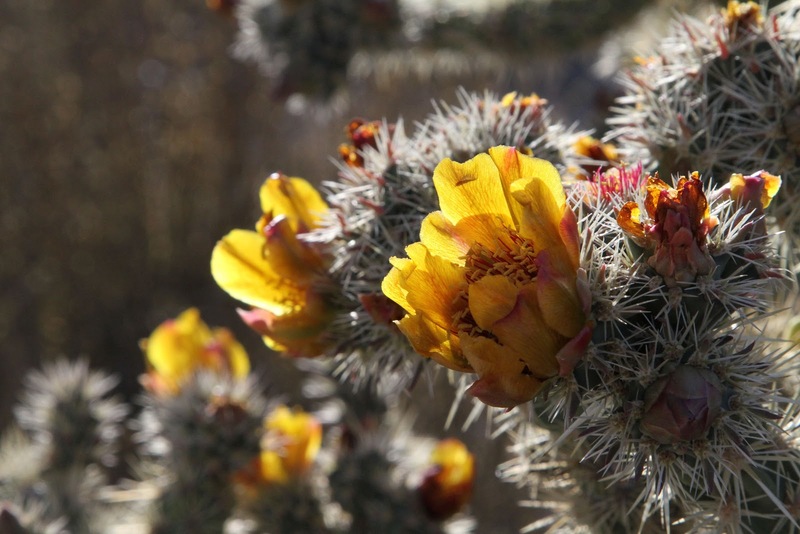 The campground is run by the National Parks Service, so it is still operating (at the moment). From I-40, the campground is 20 miles up a canyon (4400' elev.) on a bumpy paved road. The sites are a steal for $12.00/night and they provide water, pit toilets, picnic tables and trash/recycling areas. Pretty posh compared to some of the more remote places we've been (pack it in/pack it out/no water). Open range cattle were our greeting committee: Mojave National Preserve. We were one of maybe three other vehicles in the large campground. The weather was pleasantly 80's, warm in the sun but perfect in the shade. We were there on a Wednesday, and since the visitor's center was only open on the weekends I'm guessing it's more popular with the locals on the weekends. Our lonely camper, one of three in the large campground. There were several trails based out of the campgrounds that were definitely worth a return trip. Since we only had the one afternoon to spend there, we chose the mile long Rings Trail. 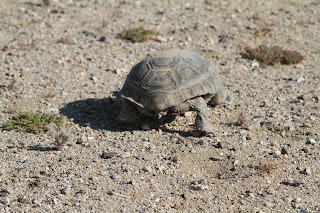 At first, we thought it was called that since it followed a canyon and went around in a loop, depositing you back to the trailhead. We soon found the true source of it's name. Big warning signs at the trailhead cautioned to bring plenty of water, tell someone your travel plans, and to pack plenty of extra supplies. We thought, geez, we were just going out for a little walk, a mile hardly even warrants bringing water (although we always do). 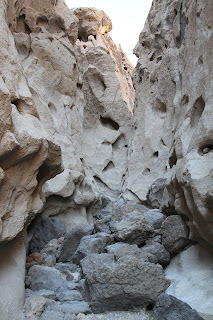 The trail followed a canyon that quickly got very narrow and rocky. It became less of a trail and more of a clamber over boulders and around the tall canyon walls. It then abruptly dropped down a dry fall. 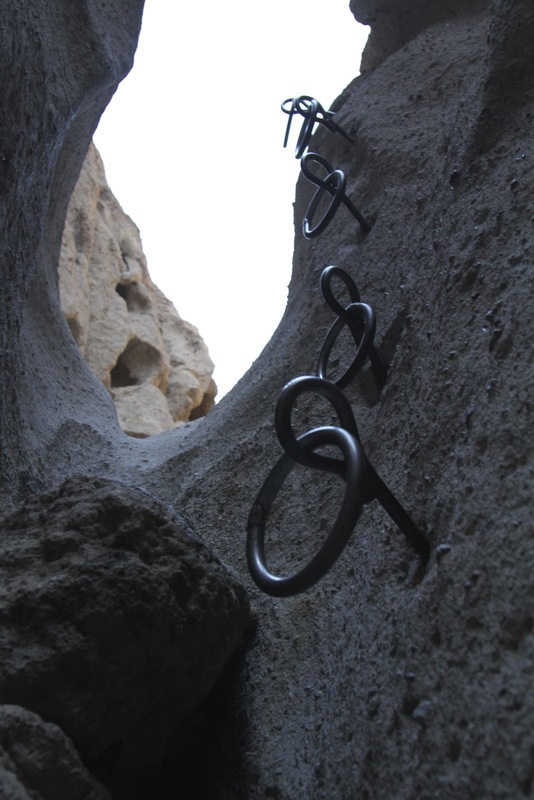 The park service had drilled into the rock and placed heavy pins with rings looped through them to aid in climbing. 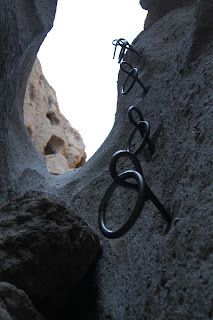 It was really a clever way to enable the hikers and, unless you are afraid of heights, not hard once you got the hang of it. 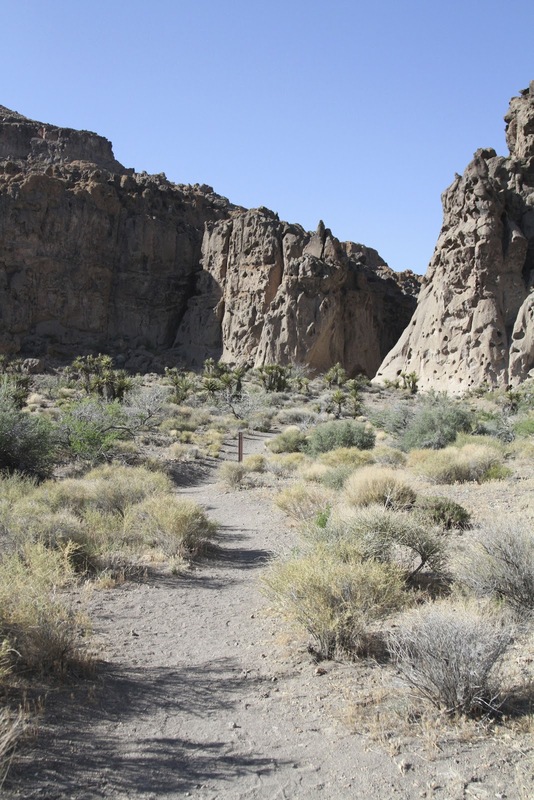 Once down, the trail opened up into a wide canyon with tall volcanic cliff faces on three sides. The "Holes-in-the-Walls" were formed by volcanic gasses bubbling up through the lava as it hardened. They made great nesting spots for birds, lizards, snakes and black widows. For that reason, it was strongly suggested to look into the holes before sticking your hand into them. The trail then made it's way around the hills, through open desert with a variety of cactus, yucca, and grasses. It was late afternoon and the gray of the rock was set off by the reds and tans of the soil and surrounding mountains. 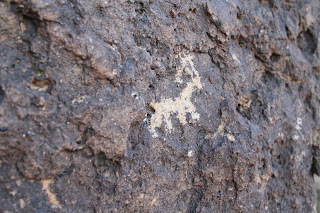 A large rock outcropping toward the end of the trail had a variety of petroglyphs carved into it's face. from these cacti stuck in our boots. Overall, it wasn't all that hard. I think the park service is required to place dire warning signs to ward off the unprepared and/or litigious. I suppose if we had taken a wrong turn we would have been wandering a while in a very hot and unforgiving environment. Fortunately we are blessed with a keen sense of direction, aided by our years of experience, uncanny ability to read the terrain, and the many, many sign posts the park service placed along the way. Went back to our camp happy to have found such an unexpectedly nice spot. 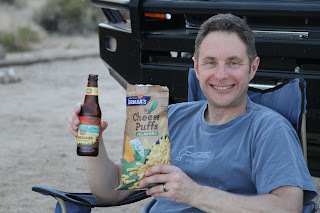 It always feels good to do a little hiking after sitting in the truck all day, and after hiking, justified snacking. Mark and his cheesy grin to go along with his cheesy puffs. Went to bed early, very quiet with just enough breeze to make it pleasant. Just as we started to get to sleep, the wind kicked up and over the course of the night started howling. It blew so hard the truck was rocking back and forth on it's axles. The gusts would die down long enough to be fooled into thinking it was over, just to start up again even harder than before. Mark got up a few times during the night just to make sure our gear was still where we had left it. Got up early in the morning with the goal of making Flagstaff by noon. On the road out, we were lucky enough to see a desert tortoise. For the many trips to the desert we've made, we've only seen a desert tortoise once before. 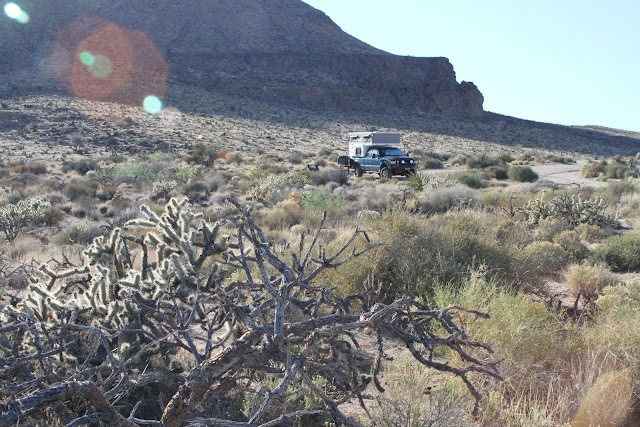 They are endangered now; illegal off-road drivers crush the dens where they seek shelter from the heat. 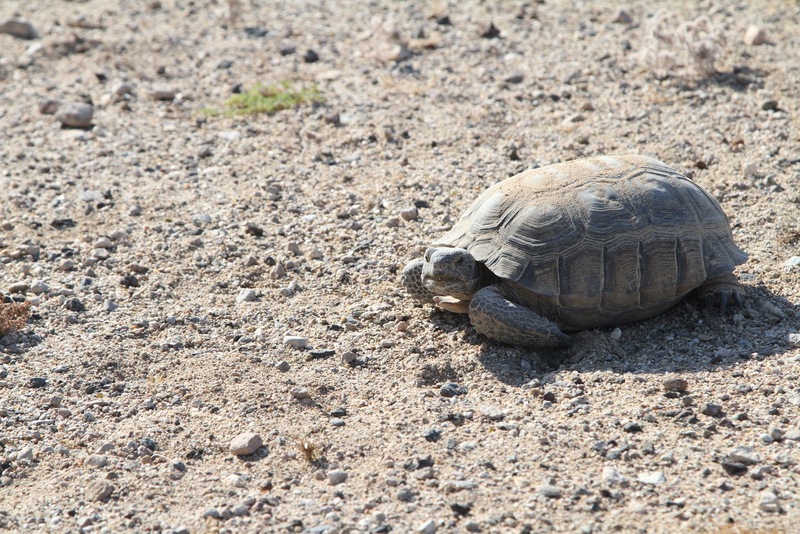 People have also released pet turtles into the wild and diseases have spread to the native tortoises, killing them off. 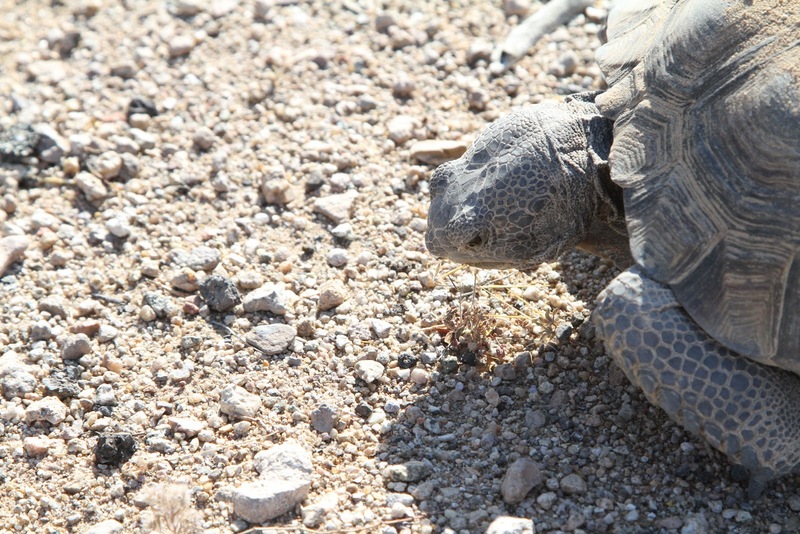 Eating a small bit of cactus growing on the side of the road. Notice the long legs and leathery skin. Desert tortoise can withstand 140 degree F ground temps, and get their only moisture from the plants they eat. They can live up to 80 years if left unmolested. All in all, Hole-in-the-Wall was a great area to visit. We have now added it to our growing list of places we'd like to spend a lot more time exploring.